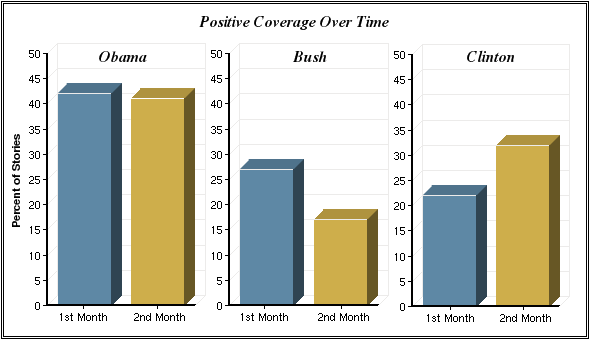 More differences in the early coverage of the last three presidents emerge in how their evaluations changed over the course of those first 60 days. Clinton began his term with intense criticism over his handling of gays in the military and flawed cabinet appointments. But during the second month in office his coverage became more positive with well-received policy positions on the budget, free trade, health care and welfare reform. For Bush, the reverse occurred. He started off strong, with praise for managing a smooth transition. But in his second month, as he articulated his budget plan and positions on issues such as global warming, water pollution and bankruptcy law, the tone began to shift. Obama had yet a different experience. 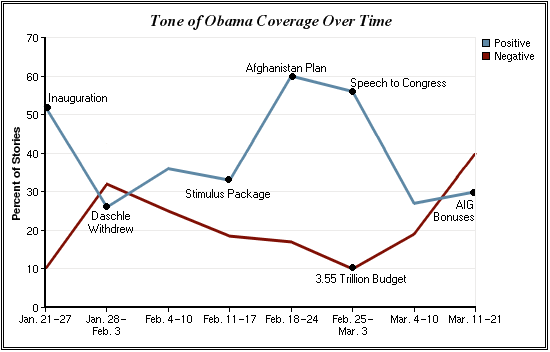 The tone of his coverage was nearly identical for both months. Looking week by week, though (a breakdown not available for the earlier studies), reveals some dips and peaks along the way. The inauguration itself was extremely well-received, with a majority of the coverage that week (52%) clearly positive in tone. Just a week later, though, when the nomination of Tom Daschle for Secretary of the Department of Health and Human Services blew up and Obama admitted on network TV that he had made mistakes, positive stories declined by half, to just 26%. And with reports like one in the New York Times on February 3 which stated, “the Obama team finds itself being criticized by bloggers on the left and the right, mocked by television comics and questioned by reporters about whether Mr. Obama is really changing the way Washington works or just changing which political party works it,” his negative stories tripled to a third of all coverage. The Obama camp quickly took action, publicly working to turn the tide. And by the third week of February, with announced plans to send 17,000 troops to Afghanistan, his first official trip abroad to Canada and a crucial prime time speech to a joint session of Congress, the president’s positive press was back up to 60%. Mid-March, however, brought more broad challenges and another dip in his positive coverage, including new, negative economic figures, a controversial $410 billion spending bill and the discovery that AIG had paid $165 million in bonuses. But others, such as a poor choice in making a joke on the Jay Leno Show about the Special Olympics and the administration’s missteps in handling the AIG bonuses, were more tied to Obama himself. And as the first 60 days came to a close, the president’s positive coverage had dropped back down to 30% and his negative coverage jumped to 40%—the only week in which negative stories outweighed positive. More than areas of vulnerability, though, what this points to is the extent to which the Obama team has taken an active role in affecting the president’s public image. As occurred throughout the campaign, when events turned against them, the team actively reached out to the public, Obama’s supporters and worked to get things back on track.